Arif Sarwari, M.D., chair of the Department of Medicine, will be honored during an investiture ceremony Monday, Dec. 3, at 3 p.m. in the Pylons Lobby. The event will also be live streamed. Sarwari also serves as an associate professor in the Section of Infectious Diseases in the Department of Medicine. 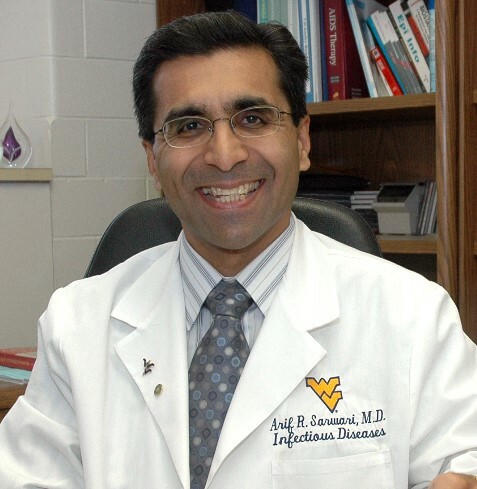 He earned his medical degree from Aga Khan University in Karachi, Pakistan, and completed his residency in internal medicine at WVU Medicine-WVU Hospitals, where he served as a chief resident. He also completed a fellowship in infectious diseases at the University of Maryland, as well as a master of science degree in epidemiology and preventative medicine. Since returning to WVU as a faculty member, he has completed a master’s degree in business administration. The Edmund B. Flink Chair in the WVU School of Medicine was created in 1978 by a gift from Hazel Ruby McQuain. It was established to support a teaching chair position that memorializes the exemplary service rendered by Dr. Edmund B. Flink. Hazel Ruby McQuain established a charitable trust which became a renowned WVU and community benefactor and continues to support programs at WVU and across the state. McQuain engaged in philanthropic endeavors of benefit to the University and local organizations for more than 20 years. She died in 2002 at the age of 93. The McQuains are recognized for more than $20,000,000 in total giving to WVU health sciences, the hospital and other clinical areas. For more information on the ceremony, contact Tricia Bolyard at 304-293-3557.